Power: “Possession of control, authority, or influence over others; ability to act or produce an effect; physical might; mental or moral efficacy…” (Webster’s Collegiate Dictionary). Authority: Power to influence or command thought, opinion, or behavior; freedom granted by one in authority; convincing force” (Webster’s Collegiate Dictionary). Right or wrong, positive or negative … we’ve all been influenced, to some degree or another, by the authority of our mothers, fathers, teachers, clergy, coaches, and government officials. Unfortunately, national and international leaders through the centuries have been mostly power-hungry tyrants; who often lead their people to a precarious pinnacle of peace and prosperity, only to plunge them to the depths of despair and destruction. Even the few benevolent rulers still had their limitations and human weaknesses. And, no matter how much morality, integrity, and capability that caring leaders possess, their good intentions are all too often compromised (if not ignored) by the people under their authority. There is, after all, an abundance of greed, envy, selfishness, and indiscriminate pursuit of pleasure and popularity within the best of societies. Incomparable: “Eminent beyond comparison; matchless; not suitable for comparison” (Webster’s Collegiate Dictionary). Matchless: “Having no equal; peerless” (Webster’s). When incomparable (utmost positive connotation of the word) is combined with power and authority, we get the best form of influence and inspiration imaginable, that one person can have on another. The following paragraph is a quote from the Eye of Prophecy article, Kingdom of God, posted 1-17-15. Let’s take an up-close and personal look at five amazing things that only one man in history has done or can do. If you answer no or even maybe to each of the five questions alongside the five matchless achievements, I would respectfully challenge you to ask yourself the question, “Why not?” First, because you honestly owe it to yourself. Second, because it is literally a matter of eternal life or death. It’s that serious. Control and Command the Laws of Nature and Physics—Would You Listen to Him? “The wine supply ran out during the festivities, so Jesus’ mother told him, ‘They have no more wine.’ … But his mother told the servants, ‘Do whatever he tells you.’ Standing nearby were six stone water jars … each could hold twenty to thirty gallons. Jesus told the servants, ‘Fill the jars with water.’ When the jars had been filled, he said, ‘Now dip some out, and take it to the master of ceremonies.’ So the servants followed his instructions. “This miraculous sign at Cana in Galilee was the first time Jesus revealed his glory…” (John 2:3-11). This was the first of many miracles Jesus performed as proof of his power and authority … in this case over the laws of nature itself. No one has ever turned water into pure wine before or since; any more than anyone has successfully converted common elements like lead into gold (Alchemy). The servants listened to Jesus and did exactly what he told them to do; knowing full well that Jesus was assuming a huge risk of embarrassment, ridicule, and future doubt of his divine credentials—who he was and what he could do—if the water remained as water. “The disciples were absolutely terrified, ‘Who is this man?’ they asked each other. 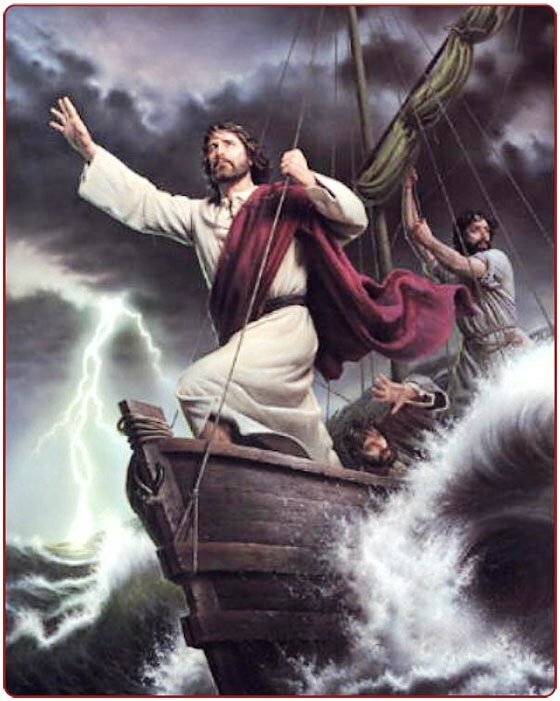 ‘Even the wind and waves obey him!’” (Mark 4:35-41). “Christ is the visible image of the invisible God. He existed before anything was created and is supreme over all creation, for through him God created everything in the heavenly realms and on earth… Everything was created through him and for him” (Colossians 1:15-16). “For there were about 5,000 men there. Jesus replied, ‘Tell them to sit down in groups of about fifty each.’ So the people all sat down. Jesus took the five loaves and two fish, looked up toward heaven, and blessed them. Then, breaking the loaves into pieces, he kept giving the bread and fish to the disciples so they could distribute it to the people. They all ate as much as they wanted, and afterward, the disciples picked up twelve baskets of leftovers!” (Luke 9:14-17). Five thousand men plus thousands more women and children, all who had listened intently to Jesus for some time were getting very hungry. Only five loaves and two fish were available. But the disciples listened to Jesus and the crown listened to the disciples, and the rest is history. This is one of my all-time favorite miracles of Jesus that stretches my imagination to the breaking point. Not my belief, only my imagination! Should you, would you also listen to him, when Jesus says, “Yes, I am the bread of life! … I am the living bread that came down from heaven. Anyone who eats this bread will live forever; and this bread, which I will offer so the world may live, is my flesh” (John 6:48-51). When Jesus was miraculously transfigured on the mountain revealing his divine glorified essence, not long before he gave his own body and blood as a redemptive sacrifice on the cross, God, the Father declared: “…This is my dearly loved Son, who brings me great joy. Listen to him” (Matthew 17:5). Dominate Demons and Defeat Incurable Diseases and Untreatable Deformities—Would You Follow Him? “Jesus cut him short, ‘Be quiet! Come out of this man,’ he ordered. At that, the demon threw the man to the floor as the crowd watched; then it came out of him without hurting him further. Amazed, the people exclaimed, ‘What authority and power this man’s words possess! Even evil spirits obey him, and they flee at his command!’ The news about Jesus spread through every village in the entire region” (Luke 4:31-37). Fallen angels (demons) know all too well who Jesus is and what power he has over Satan’s evil kingdom. But, of course, they would never follow him; as their choice had been made and their destiny had been sealed long before. Nor would Jesus allow them to even speak of him, for two main reasons: (1) Jesus commanded the demons to be silent to demonstrate his divine authority over them. (2) He wanted the crowds to acknowledge and follow him willingly because of his redemptive words of life and hope, attested to by his miracles. Not because of what any demon might say. “Many were possessed by demons, and the demons came out at his command, shouting, ‘You are the Son of God!’ But because they knew he was the Messiah, he rebuked them and refused to let them speak” (Luke 4:41). “Instantly, the man was healed! He rolled up his sleeping mat and began walking! But this miracle happened on the Sabbath, so the Jewish leaders objected. They said to the man who was cured, ‘You can’t work on the Sabbath! The law doesn’t allow you to carry that sleeping mat!’” (John 5:1-10). Astonishing! 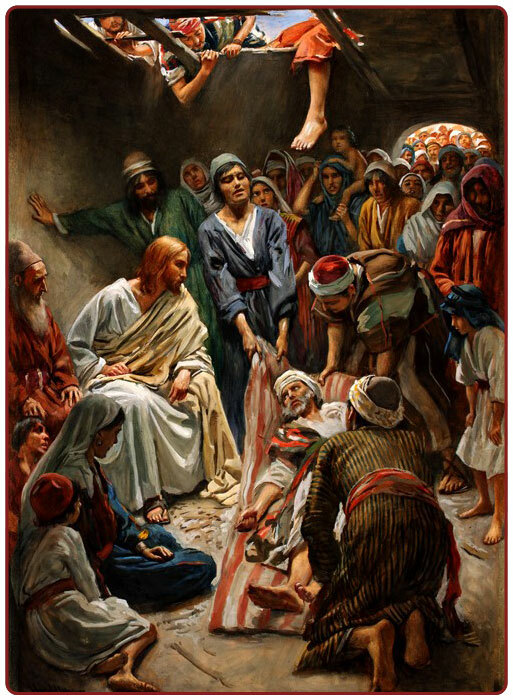 This was not the only time that Orthodox Jewish leaders criticized and trivialized an astounding miracle of healing that Jesus had performed, because of their technicality that Jesus healed someone on the Sabbath. In this case they considered both the healing and the healed man carrying his mat to be “work” which was a violation of the Sabbath. Although many people, even including some Pharisees, believed in Messiah Jesus and followed him, the majority did not. They had already made up their minds that Jesus’s powerful words and demonstration of authority over all kinds of diseases and disabilities was a threat to their own authority. They would not listen to him, let alone follow him. They were, as Jesus told them, “Blind guides leading the blind” (Matthew 15:14). Not so, with those who have been saved by Jesus, the light of the world. Once we were blind, but now we can see. And we follow him. Said Jesus to the people who demanded to know if he was the Messiah: “…I have already told you, and you don’t believe me. The proof is the work I do in my Father’s name. But you don’t believe me because you are not my sheep. My sheep listen to my voice; I know them, and they follow me” (John 10:25-27). “Then he touched their eyes and said, ‘Because of your faith, it will happen.’ Then their eyes were opened, and they could see! Jesus sternly warned them. ‘Don’t tell anyone about this.’ But instead, they went out and spread his fame all over the region” (Matthew 9:27-31). Astounding … Jesus miracle of making two blind men see, of course! But also their unwavering assurance that Jesus could and would heal them. They were so persistent in this confidence that they followed Jesus right into the very house where he was staying. Notice, that Jesus told them not to tell anyone what he had done. Jesus had said this to others he had healed early in his magnificent ministry. Why? Because he wanted people to believe and follow him for who he was (Messiah), not just because of his miracles. That his ultimate purpose was that of spiritual healing, because of his great compassion and love for the human race that he created. Forgive Sins, and Pardon the Eternal Penalty of Sin (Because of His Unconditional Love)—Would You Believe in Him? “And the man jumped up, grabbed his mat, and walked out through the stunned onlookers. They were all amazed and praised God, exclaiming, ‘We’ve never seen anything like this before!’” (Mark 2:1-12). Jesus performed countless miracles that had never been seen before. Incurable diseases, inoperable disabilities, irreversible blindness and deafness, and irrevocable death itself were no match for the matchless Son of David, Son of Man, and Son of God. By the very fact that Jesus had read their minds (what they were thinking), you would think that the religious leaders should have realized immediately that Jesus was no ordinary man. 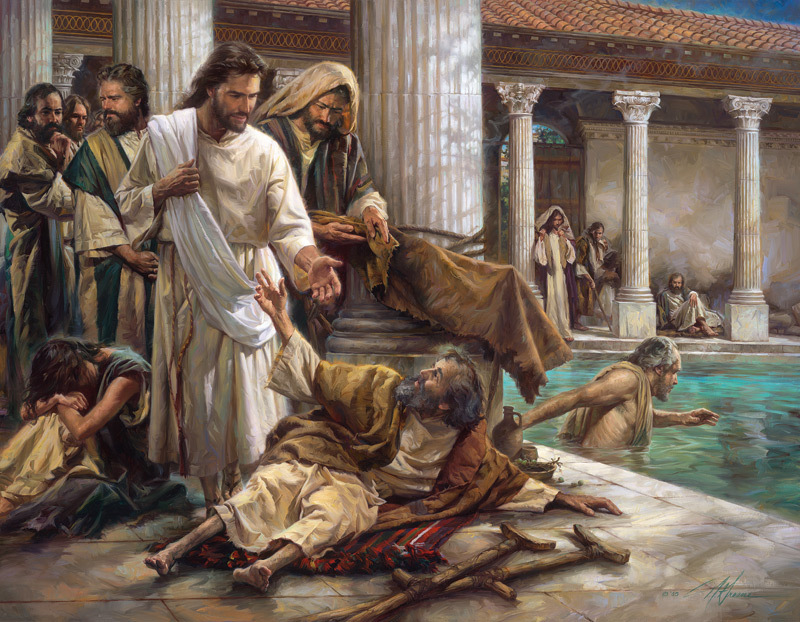 When Jesus asked them whether it was more difficult for him to tell the paralytic that his sins were forgiven or to instantly heal the man’s untreatable condition, he knew how they would react. They would affirm that it’s easy for anyone to say someone’s sins can be forgiven. Those are just words, and in this case words of blasphemy, for only God can forgive sins. Which was exactly the point! By merely speaking the words, Jesus right in front of them told the crippled man to stand up and go home. Only God has that kind of power! And only God has the authority to forgive sins. So, then, just who might Jesus be? The paralyzed man and his four companions knew and believed Jesus was the Messiah. As did many in the crowd before and after what Jesus said and did. What more or better proof did the religious leaders need? Sadly, they, like so many religious or irreligious leaders and their followers today, deny the authority and power Jesus has to forgive their sins—if they would only believe in him and his atoning sacrifice on the Cross of Calvary. “Jesus replied, ‘I tell you the truth, unless you are born again, you cannot see the Kingdom of God” (John 3:1-3). Talk about getting to the point, to the real issues … Jesus often did that! After Jesus explained to Nicodemus what “born again” means, he said: “…But the Son of Man has come down from heaven. And as Moses lifted up the bronze snake on a pole in the wilderness, so the Son of Man must be lifted up, so that everyone who believes in him will have eternal life” (Verses 13-15). As a Pharisee, Nicodemus would have known the history of the emblematic bronze snake during the wanderings of his ancestors in the wilderness, specifically their sins and rebellion against God. He also would have remembered and understood that simply looking at the bronze snake had healed them. He knew that the snakes represented their sins and punishment for sin (which has bitten everyone who has ever lived). “So the Lord sent poisonous snakes among the people, and many were bitten and died. Then the people came to Moses and cried out, ‘We have sinned by speaking against the Lord and against you. Pray that the Lord will take away the snakes. So Moses prayed for the people. Then the Lord told him, ‘Make a replica of a poisonous snake and attach it to a pole. All who are bitten will live if they simply look at it!’ So Moses made a snake out of bronze and attached it to the pole. Then anyone who was bitten by a snake could look at the bronze snake and be healed!” (Numbers 21:6-9). When Jesus put all this together with perhaps the simplest yet most profound statement of God’s love and forgiveness and pardon of sin that immediately produces eternal life through Jesus, Nicodemus believed that Jesus was Messiah, the Son of God and the Son of Man. We know this because later we discover that Nicodemus had become a believer, albeit one that silently followed Jesus. “For God loved the world so much that he gave his one and only Son, so that everyone who believes in him will not perish but have eternal life. God sent his Son into the world not to judge the world, but to save the world through him. There is no judgment against anyone who believes in him. But anyone who does not believe in him has already been judged for not believing in God’s one and only Son” (John 3:16-18). “As they were eating, Jesus took some bread and blessed it. Then he broke it in pieces and gave it to the disciples, saying, ‘Take this and eat it, for this is my body.’ And he took a cup of wine and gave thanks to God for it. He gave it to them and said, ‘Each of you drink from it, for this is my blood, which confirms the covenant between God and his people. It is poured out as a sacrifice to forgive the sins of many’” (Matthew 26:26-28). Soon afterward, on their way to the Mount of Olives, Jesus said: “But after I have been raised from the dead, I will go ahead of you to Galilee and meet you there” (Verse 32). Once again, as the Son of God and God the Son, only Jesus could predict, then accomplish his stunning resurrection from the dead. Shortly before he returned to heaven, Jesus made yet another bold statement confirming his divine dominion over the world—even greater authority than he possessed before his resurrection and glorification, when he was restricted by time and space here on this earth. Limited because he chose to strip himself of the absolute power that he shared with God his Father from the ancient past. Glory that he set aside to become a human being so that he could pay for the penalty of our sins. “Jesus came and told his disciples, ‘I have been given all authority in heaven and on earth” (Matthew 28:18, italics for emphasis). Why does Jesus have the power and authority to forever pardon the penalty of our sins? I think you already know the answer. Because he paid the ultimate price demanded by God—a totally innocent, perfect (sinless) bodily sacrifice that only Jesus could offer. “See, my servant will prosper; he will be highly exalted. But many were amazed when they saw him. His fact was so disfigured he seemed hardly human, and from his appearance, one would scarcely know he was a man. And he will startle many nations. 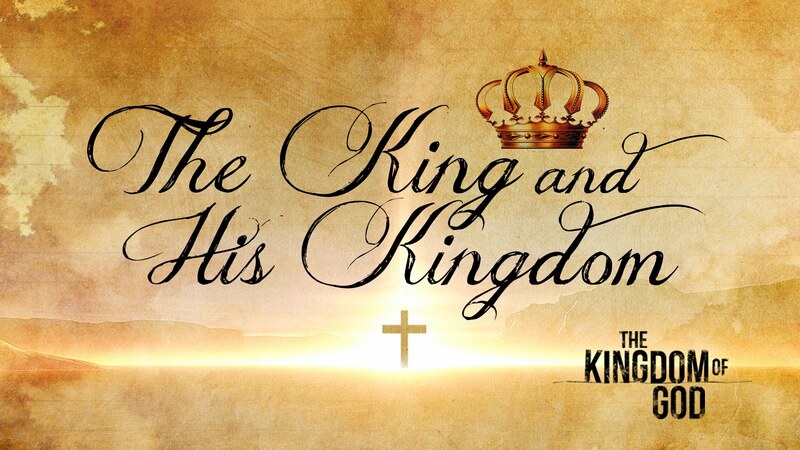 Kings will stand speechless in his presence…” (Isaiah 52:13-15). “But he was pierced for our rebellion, crushed for our sins. He was beaten so we could be whole. He was whipped so we could be healed. All of us, like sheep, have strayed away. We have left God’s paths to follow our own. Yet the Lord laid on him the sins of us all” (Isaiah 53:5-6). That is why Messiah Jesus has power and authority to forgive us for all the wrong things we’ve done. “He (God) made Him (Jesus) who knew no sin to be sin on our behalf, so that we might become the righteousness of God in Him” (II Corinthians 5:21, NASB). Abolish Death Itself and Grant Eternal Life through Resurrection From the Dead—Would You Trust Him? “When Jesus arrived at Bethany, he was told that Lazarus had already been in his grave for four days … many of the people had come to console Martha and Mary in their loss … Martha said to Jesus, ‘Lord, if only you had been here, my brother would not have died…’” (John 11:17-21). “Jesus told her, ‘Your brother will rise again.’ ‘Yes,’ Martha said, ‘he will rise when everyone else rises at the last day’” (Verses 23-24). Martha knew something about the final resurrection, but she didn’t fully comprehend that bodily resurrection was possible only by and through Jesus Christ, the Savior of mankind. “Jesus told her, ‘I AM the resurrection and the life. Anyone who believes in me will live, even after dying. Everyone who lives in me and believes in me will never ever die. Do you believe this, Martha?’” (Verses 25-26, italics and capitalized for emphasis). When Jesus put it that way, Martha understood what we all must grasp if we are going to be among those resurrected by the power and authority of Jesus Christ at the rapture. Whether dead or alive, all believers will be transformed with brand new (resurrected) bodies. “Yes, Lord … I have always believed you are the Messiah, the Son of God, the one who has come into the world from God” (Verse 27). Jesus then went to the tomb where Lazarus had been buried four days earlier and proceeded to do exactly what he said he would do and could do. With power and authority, “Jesus shouted, ‘Lazarus, come out!’ And the dead man came out, his hands and feet bound in grave clothes, his face wrapped in a head cloth. Jesus told them, ‘Unwrap him and let him go!’” (Verses 43-44). “The leading priests and teachers of religious law also mocked Jesus. ‘He saved others,’ they scoffed, ‘but he can’t save himself! Let this Messiah, this King of Israel, come down from the cross so we can see it and believe him!’ Even the men who were crucified with Jesus ridiculed him” (Mark 15:24-32). Everything Jesus said and did was remarkable. None more so than one of seven things he spoke while hanging on the cross. “Jesus said, ‘Father, forgive them, for they don’t know what they are doing’” (Luke 23:34). What amazing grace and love for Jesus to say those words as he was dying an excruciating death on the cross. Not only didn’t they fully realize what they were doing to Jesus (why Jesus was actually on the cross), they also couldn’t fathom the implications of what they were saying. Though the people said it sarcastically to mock him; indeed, Jesus saved and would save others … past, present, and future. They mockingly challenged him to come down from the cross; completely ignorant of the fact that had Jesus called a legion of angels to destroy his crucifiers and deliver him from the cross, he would not have the power and authority to resurrect believers (in him) from the dead. Jesus, himself, must first rise from the dead. And he couldn’t do that unless he completed the mission for which he came to this world. 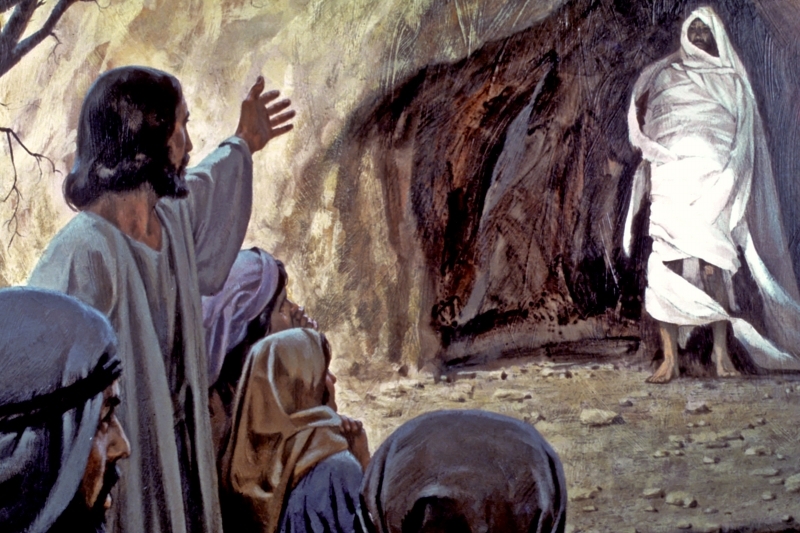 “But very early on Sunday morning, the women went to the tomb … They found that the stone had been rolled away from the entrance. So they went in, but they didn’t find the body of the Lord Jesus. As they stood there puzzled, two men suddenly appeared to them, clothed in dazzling robes. “The women were terrified and bowed with their faces to the ground. Then the men asked, ‘Why are you looking among the dead for someone who is alive? He isn’t here! 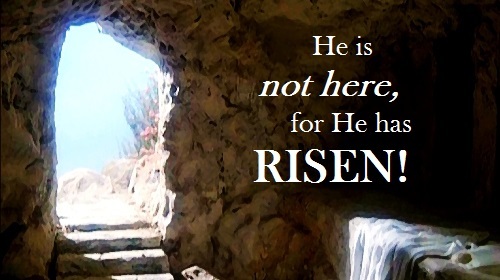 He is risen from the dead!’” (Luke 24:1-6). “We tell you this directly from the Lord: We who are still living when the Lord returns will not meet him ahead of those who died. For the Lord himself will come down from heaven with a commanding shout, with the voice of the archangel, and with the trumpet call of God. First, the Christians who have died will rise from their graves. Then, together with them, we who are still alive and remain on the earth will be caught up in the clouds to meet the Lord in the air. Then we will be with the Lord forever. So encourage each other with these words” (I Thessalonians 4:15-18). Do you trust Jesus Christ—his incomparable power and authority—to do such a thing? “Then, when our dying bodies have been transformed into bodies that will never die, this Scripture will be fulfilled: ‘Death is swallowed up in victory. O death, where is your victory? O death, where is your sting?’” (I Corinthians 15:51-55). Said Jesus to John: “…Don’t be afraid! I am the First and the Last. I am the living one. I died, but look—I am alive forever and ever! And I hold the keys of death and the grave” (Revelation 1:17-18). Govern the Earth and Rule the Nations with Truth, Justice, and Peace—Would You Love, Honor, and Obey Him? “…Blessing and honor and glory and power belong to the one sitting on the throne and to the Lamb forever and ever” (Revelation 5:13). “Then I heard a loud voice shouting across the heaven, ‘It has come at last—salvation and power and the kingdom of our God, and the authority of his Christ…” (Revelation 12:10). “His government and its peace will never end. He will rule with fairness and justice from the throne of his ancestor David for all eternity…” (Isaiah 9:7). “Look at my servant, whom I strengthen. He is my chosen one, who pleases me. I have put my Spirit upon him. He will bring justice to the nations” (Isaiah 42:1). The evidence is irrefutable. Scripture is brimming with the prophetic and historical record of who Jesus is, what he has done, and what he will do. Near the end of John’s Gospel, he writes: “The disciples saw Jesus do many other miraculous signs in addition to the ones recorded in this book. But these are written so that you may continue to believe that Jesus is the Messiah, the Son of God, and that by believing in him you will have life by the power of his name” (John 20:30-31, italics for emphasis). 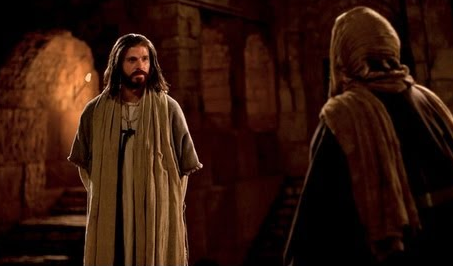 “Simon Peter answered, ‘You are the Messiah, the Son of the living God.’” (Matthew 16:13-16).